Саундтрек к фильму "Призрак любви", режиссер Dino Risi (Дино Риси). В ролях Марчелло Мастрояни (Marcello Mastroianni), Роми Шнайдер (Romy Schneider) и другие. 1981 WEA Records original pressing, made in Italy. 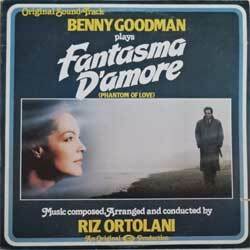 Tracks: Phantom Of Love (Main title), Unforgettable Love, Do It To Me, Unforgettable Love (variations on the theme), Phantom Of Love (trio), Just Another Evening, Phantom Of Love (variations on the theme), Unforgettable love, Rhythm Trio, Love's Memories, Music And Love, Phantom Of Love & Unforgettable Love. Music composed, arranged and conducted by RIZ ORTOLANI. Main themes (tracks 1,2,4,5,7,10,12) played by BENNY GOODMAN. Состояние винил и конверт отличное-.